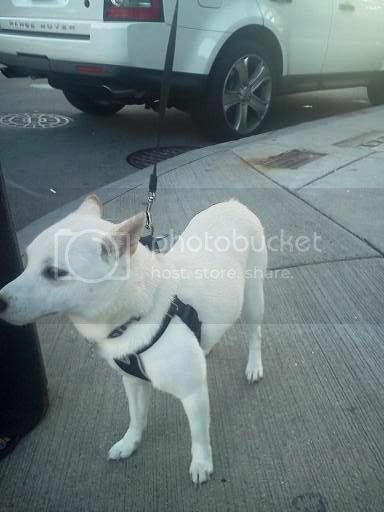 I was planning on giving a Toki update, since I ask my parents how he's doing every night, but then I saw another Shiba roaming the streets of Boston! I've started volunteering at the MSPCA (yes, there is a point to this apparently random transition). The first two weeks were training and orientation, so this was my first time really volunteering. I'm only working with the small animals (rabbits, guinea pigs, ferrets, hamsters, birds, etc...). I might see if I can get trained to walk the dogs later on? But for now, I'm content playing with the bunnies and cleaning their cages. Or really, playing with them while attempting to clean their cages. Some of those little guys are just so adorable! At any rate, here comes the connection to the seemingly random transition. As I was going in, I noticed some agility equipment. Thought that seemed pretty cool. I'd like to try that with Toki at some point. Anyway, as I was leaving, it turns out that there were agility classes going on or something, and the class was letting out. I caught sight of a Shiba a good distance away, walking toward the gate leading out of the area. Like a creep, I bee-lined over to them. He was a big boy. I don't see many Shibas, especially now, so I don't have much to compare to, but even in my limited experience, he seemed like a big Shiba. His owner was friendly, and he was such a well-behaved boy. Sitting and waiting and everything while I took a picture. How rare for a Shiba to sit and stay for so long on command! He's such a gorgeous little boy. I was so happy to see another Shiba. This is also my first sesame! At least, I'm pretty sure he's a sesame, I've never seen one before. I definitely don't think he's red. So my hunt for Boston Shibas continues! Unfortunately, I didn't have my camera on me today when I saw one (a cream mini). But I did have my phone! And I did run across the street like a creep and scare the poor pup. A one-year-old girl named Winter. What an adorable name for a cream Shiba! In typical Shiba fashion, she refused to sit when told. That's okay. She didn't seem to happy to have my phone shoved in her face, so I made the picture as quick as I could. Little girl couldn't hold still though, hence the awful picture that ensued. Only one when she wasn't moving. I'm not going to rant now about how I don't like the mini Shibas, or whatever it is because I was so happy to see one. And I had just been thinking as I was walking how much I miss my Toki. All of a sudden, just as I'm thinking about my little boy - who my parents said is behaving MUCH better now that I'm not home...not sure what to think of that one - a Shiba appears before me! [insert holy music] It was fate! And who am I to say no to fate? I couldn't. I had to take a picture. By the way, an update on my Tokidoki. He is apparently much more well behaved now that I'm home. In some ways, of course. He still likes to be exactly where he shouldn't be, greatly enjoying the comfy leather of my dad's recliner. One look, however, and he knows he has to get off. He's also playing rougher now, which I blame on my dad and the fact that my dad allows play biting. Mom hates it. I'm not there to stop it. I guess as long as my dad stops him from biting too hard, it should be fine. He's a big boy now, with big boy teeth. But he has apparently gotten much better with strangers, which is nice. He plays with them and lets them pet him. Supposedly. It's so hard to believe! I have to see it for myself. I was going to go home for the long weekend, but I'm busy up in Boston so I wasn't able to. I won't be able to see my little boy until Thanksgiving. Hope he still remembers me by then! So, my mom came to visit me for the weekend. That was nice. I was happy to see her, even though it meant that I didn't really have time to get any work done or to try to get in touch with potential new friends. At any rate, I enjoyed the company. I don't like being in my apartment by myself, but I'm not going to complain about that right now. What I will say is that I got incredibly excited at seeing a Shiba the other day! 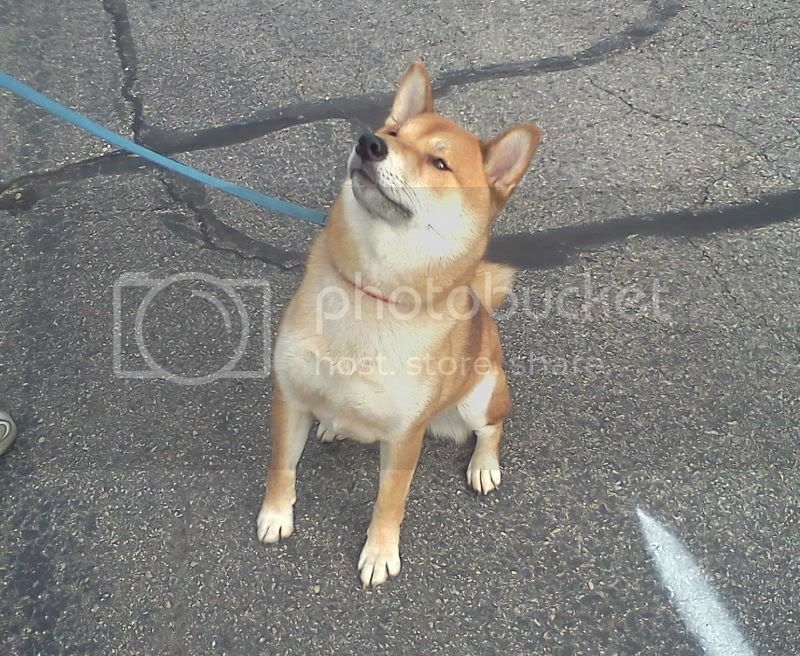 My mom and I were on our way to the store to exchange something that I thought didn't work - turns out, it did and I was doing something wrong - and as we're walking, I saw a Shiba on the other side of the street. I had to point it out to my mom, who got really excited as well and who proceeded to debate with me about whether or not Toki would be a happy puppy in the city. I think not. She thinks that he would be. Anyway, moving along! I wasn't wearing my glasses, but from what I could see, the Shiba was beautiful. Red. A different sort of red than Toki, though, if that makes sense. It was a brighter red. I wish I could have taken a picture, but as it was on the other side of the street and walking away fast, I didn't get the chance to creep the way I would have liked. I wonder if I'm remembering my little boy wrong or something and he really is that bright a red color. Since I'm in school and missing my Toki, I figured that I'd go on the lookout for Shibas in Boston. I'm here anyway, so I might as well. I should be a total creeper and take pictures of them too, but hey...I'm not that bad, I think. Although, I was tempted to. But that's beside the point. Today, BU held its Comm. Ave. Fair! Very exciting. Departments and clubs had booths all along campus on Comm. Ave. It is a long street, and therefore a long fair. I didn't make it to the end of it, since I wanted to come back to the apartment and work on setting some stuff up still. Anyway! Back to the story. Comm. Ave. Fair was pretty interesting. There was even miniature golf set up. I am a huge fan of miniature golf. I love playing it. To an almost ridiculous degree. Unfortunately, I didn't get the chance to play and show off my incredible lack of skill. But~! Around the area that they were doing miniature golf, guess what I saw! I Shiba Inu! A little black and tan. Looked young, and horrified. Reminded me of Toki. His tail down, backed against his owner, looking everywhere. Like the awesome person that I am, I ran up to them, got really excited, and explained that I had a Shiba at home who I really missed. I would have gone down to pet the little cutie, but he looked so freaked out that I decided against it and just left. Made me miss Toki even more. But now it gives me something to look out for! So, I said I would explain this whole going back to school thing that I mentioned in a previous post. Here's the explanation. I am going back to school. Full time. Congratulations to me! I am madly in love with Boston, so that's where I applied and that's where I got accepted. It's actually where I'm sitting right now in my awesome little apartment with almost no furniture. The point is, though, that I'm here...away from home. And Toki is...well...he's home. My poor baby, I miss him so much! I'm still moving in and getting ready for school to start, so my parents are with me right now. That means that Toki is spending a weekend of bonding with my cousin and her friends. But now that I'm in school so far away, I'm worried. What about my baby boy? My parents work during the day. My cousin goes to school. He's gotten better, no accidents lately and he's recently decided that he doesn't feel like going potty until about 5:30, which is when my mom usually comes home from work. Nice and convenient that we can completely skip over what used to be afternoon bonding walks. Well, not so much bonding, but the point is that he can hold it in for much longer now. We're grateful for that. But it isn't him not having accidents that worries me. It's him being lonely. While I'm usually there to spend nearly all my time with him, he's suddenly going to be stuck in his room all day (especially since his recent reign of destruction began). He's going to spend all day cooped up when he's used to me driving him around, playing with him, and taking him to the park. I wish I could have taken him to the park all this week, but unfortuantely, Irene messed up that plan and destroyed the park. Point being: my little boy is all alone now during the day. He's going to get lots of love and attention when my parents and my cousin are home, but my mom said that even then he gets sad when I'm not home. So my parents thought of taking him to a doggy day care type of place. We went over to this one that looked fantastic: they have cameras so that people can watch their dogs. But they require an interview that I don't think Toki would pass. He's a wonderful little boy and has gotten much better. He lets people pet him more now than he did before. But he would never let a stranger leash him. And event hough he gets along great with most dogs, when there are too many he gets nervous. There were about 70 dogs at that place, the day we went to visit. That's a little bit too many. It would have been nice to have video feed of him so I could make sure he's doing okay, though. Angel got me a new bone. I love it. It tastes so good and it's so much fun. I want to take it everywhere with me. But her mom keeps taking it away and only gives it to me in the car. I already like the car, but now I like the car more. Except, last time I went into the car, Angel and her mom weren't there. I got my bone, so it was alright. We drove around and now, I've playing lots and lots with Angel's cousin. I wonder where Angel is. I don't like it too much, but I guess it's not too bad. I can play with my new bone until Angel comes back. It's been a while since I've posted anything, and there is a reason for that, I swear. I've been getting ready to go back to school! Finally! But that's another story for another post. Right now, we're going to talk about Toki's 1st birthday and his 'big boy pants'! Yes, you read right! Toki is now officially one year old. I didn't want to post anything about it earlier because, well, we have absolutely no idea when his birthday is. We adopted him in December when he was about 5 months old. Which means that, around the end of July, he was probably turning 1 year old. Did anyone know that the supermarket sells dog-friendly ice cream? Well, we got some for Toki. It's his favorite treat now, and we gave him some on the last day of July to celebrate his birthday. If anyone out there has no idea what it looks like to feed a dog ice cream, I wish I had taken a video. It's actually funny. Around the same time we were celebrating his birthday, Toki decided to make a few changes of his own: our wimpy puppy finally put on his big boy pants. He has been lifting his leg, on occasion (and falling because he loses his balance on occasion). He's been getting into more trouble lately, hard to believe of course. Jumping on everything, including the table, digging at everything, chewing all our pens and pencils. Yes, beware! No pen or pencil is safe in our home! No matter where you hide, Toki will find you! Most of this isn't too much of a problem. It was, in fact, a phase we were expecting, dreading but expecting. The other day, we found a lost dog roaming our lonely street. When my cousin was walking Toki, the dog came over. Toki and the dog - we found out later that his name is Diego - were playing. This, of course, wasn't at all unusual, Toki usually gets along with most dogs. Even though Diego is bigger than Toki, our little Shiba didn't mind and enjoyed himself, doing his usual dance of crawling along on his stomach and jumping around to get Diego's attention. They got along great, or so I'm told. My cousin, Janice, brought Toki back into the house, making sure Diego didn't follow, despite his determination to do so. Why did Janice do nothing about Diego? Well, one of our neighbors frequently lets her dog run loose around the block. Janice had never seen that dog and thought it was Diego. I came home about an hour later. Diego was sitting next to the stairs leading to the porch, and I didn't recognize him. A dirty, scruffy thing, I led him up to the porch, locked him there, gave him a toy, and looked for tags. He's a playful, energetic pup which made trying to read his tag (singular, the others were mysteriously missing) much more difficult than I had been expecting. Fortunately, I found the number of an animal hospital which we called and which in turn called his owners. While we were waiting for his mom to pick him up, Diego stayed on our porch. Toki, of course, wasn't oblivious to my coming home: he heard me and started barking, trying to get out. My cousin recognized Diego as the dog that had played with Toki before, so she let him out to greet me and the lost dog. Unfortunately, that's where plans went awry. Suddenly, Toki ran through the door and started snarling and snapping at Diego, who was confused and convinced that they were still playing like they had before. Before anyone says that it's a territorial thing, I'd like to point out that Alicia, my friend who walked Toki for us while we were away on vacation, brought her dog over at one point when I wadn't home and Toki got along well with him. Toki had also previously been playing with Diego. What happened? Janice thinks it's because I came home and was paying attention to Diego instead of him. Either way, we brought Toki inside, I stayed with him and Janice kept Diego company until his mom came and the crisis was averted. He did something similar to another dog at the park who he had previously played with but who suddenly decided he wanted to jump on me. I wonder if it has to do with me going up to school more often now. I'm not entirely sure what to do with Toki now. He's never acted aggressively with another dog before, it's one fo the few behavioral issues that we aren't prepared for: with the loose dog who frequently makes his way to our yard and plays with him and our visits to the dog park. All in all, no one is really liking Toki's new big boy pants but no one knows how to take them off. I don't like when Angel pays attention to other dogs and not to me. Angel is my pack, not theirs. She leaves a lot anf I don't like it. I like it when shes home and paying attention to me. I don't like it when she's home and not paying attention to me. So, we went to the shore for 4th of July weekend. Fireworks all weekend, so it was fantastic, albeit ridiculously crowded. Fortunately, our house is on the bay, so we didn't really need to go to the beach for the water. Toki, of course, came with us. He loved the ride there. Usually, he sleeps for most of it so he doesn't get sick. But this time, he wanted to put his head out the window (I only open it just enough for his nose to peek out) and he was standing on the armrest-thing in the middle so he could look out the front window. He loves standing there for some reason. He didn't get sick at all the entire trip and seemed excited to be at the shore. The first thing he does, every time, is go into the back room and take all of his toys out of his crate. Then, he goes onto the porch in the backyard where he buries his bones, and he digs one up. My poor baby always cries at the shore at night. We don't know why. At first, we thought that it was normal puppy behavior of not wanting to be alone. It's a possibility, but a strange one. The reason it's strange? When we first got Toki, ever since his first night, he never cried when we left him in his room alone at night. Now, he does it every single night at the shore. Well, my clever mother came up with a solution: keep the TV on. As long as we don't make too much noise, he sleeps straight through the night. And so do we. It didn't work the first night. My cousins came back late and drunk and...well...needless to say they weren't necessarily quiet. Ignoring the fact that someone came into the house, they showered upstairs and he was up for the rest of the night howling and crying. We woke up in the morning and he was sitting at the bottom of the stairs waiting for us. A note to the reader: his room is nowhere near the bottom of the stairs. In fact, the gate should have kept him on the other side of the house near the kitchen. We also mount the gate higher so that he can't jump over it. We still haven't figured out how he got out. Saturday night was quiet, but unfortunately eventful. Cue the fireworks. A few days early, but that wouldn't dampen the shore's enthusiasm. The fireworks freaked my poor puppy out so much that he ran straight back into the house and cowered against a complete stranger in fear. I had been upstairs and when I came down, he pressed himself against me and refused to move for the better part of two hours. He spent almost the whole time shaking and crying the moment anyone tried to get up. A thunderstorm over night and throughout the next day didn't help the situation at all. But that aside, we had a wonderful time at the shore. Toki came with us to the beach and made a friend. We walked around the block and he made a friend. He made lots of friends, actually. We had a barbecue in a thunderstorm with Toki hiding behind us while we watched my cousin and my dad at the grill with their umbrellas. We went crabbing, fishing, and set up a kiddie pool while Toki relaxed in the shade and played with his toys. He even got his own special holiday treat: doggie ice cream! There are these weird loud noises. They come from nowhere. They explode and there are these weird lights in the sky. I don't like it. But I did like my ice cream. And I liked running on the beach and meeting new dogs. We don't usually see many dogs when we go far away like this. That's why I'd rather go to the park. I don't like it at night, either. But it's not so bad because during the day, I can go outside whenever I want and everything is new and fun to watch. So, we got back from California a while ago. Toki seemed to be doing just fine in spite of the picture that Alicia sent us of him where he looked like he had lost weight. He had actually gained a bit. But he's still pretty slim so we're good with that. Although it makes it a bit annoying when he tries to jump on us. Most surprising: he and Alicia were getting along. Well, getting along better than when we had left. Alicia had sent us updates nearly every day and was very excited when, after a week, she finally got to pet him. While holding out a treat. And he ran away as soon as he noticed what was going on. But she was very pleased with the improvement, so I'm trying not to damper her enthusiasm. A few days after we came back from California, I was off again. Unfortunately, this time Alicia was coming with me. Some friends of mine and I went and trekked up to Canada. The trip was magnificent, and filled with very few updates on my little boy. My parents decided that they and my cousins would come home early from work to walk him and spend time with him. Another week and supposedly he was doing fine. It started with an eventful weekend. Toki ran away. And not only did he run away, but he ran from the shore house, an area which he doesn't know as well as the other house. My mother and her love of the dramatics stopped at : "Toki ran away" and decided not to elaborate until well-after my near-heart-attack. As it turns out, they had gone to the shore for the weekend and had some friends come by. For some unknown reason, one of my mom's friends had convinced himself that Toki liked him. He took the nervous puppy for obliviously awkward walks. He tried to unleash Toki and got scratched - the little monster's nails are ridiculously sharp. After a time, he had still somehow managed to convince himself that Toki loved him and decided to take my pup to the front porch - where we never let him go without a leash because he can fit through the fence - and try to leash him. Well...as mentioned, Toki can squeeze through the fence. He squeezed and bolted. Down our relatively quiet street, across a usually busy street, and into a stranger's yard. Mom chased him all the way, screaming and waving cheese and managed to corner him in the other person's yard before leashing him and taking him back. Fun start. The rest was fairly uneventful. Until I got home. About a week after I had left with my friends for Canada. I found out that he hadn't eaten, drunk, gone to the bathroom, or slept at all that day. When I got home, I managed to get him to eat only by taking the food out of his bowl and placing it directly in front of him. He was lethargic and barely moved even to greet me. I was nervous and on the verge of calling the vet's office, but they were closed by the time I got home. I decided to wait the night out and call in the morning. As it turned out, he was perfectly fine in the morning and has been back to his monstrous self since. I don't like when Angel leaves. I guess it's alright if it's not too long, but I still don't like it. I'm stuck in my room a lot and even when I cry there's no one there to hear me. There's nothing to do and it's very boring. And even when they let me out, they don't really play as much as Angel does. She's back now so everything is okay. I just wish she wouldn't leave anymore so I can keep playing with her all day like we usually do. Yesterday was my brother's birthday. He lives in California, about an hour from LA depending on traffic, and a lot of our family is in California as well. Naturally, my family wanted to be there for his birthday. Or should I say 'here'? Here we are, in California. And there Toki is...all the way in New Jersey. By 'we', I mean my parents and I. We got here a few days ago and are leaving again in a few days, the total time away from hone: 7 days. This is not only the longest that I've been away from Toki, but also the longest that my parents have been away as well. My cousin is still home, but she works and takes classes so my poor pup is by himself all during the day. My friend, now known as Alicia, is taking care of his afternoon walks. My poor baby got left behind. It was difficult finding out what to do with Toki while we're away. He is, as everyone probably knows by now, the world's most nervous puppy. Anyone that he isn't used to sets him into a nervous frenzy, and he is comfortable with very few people. Most of those people are not there to help us watch him. Alicia isn't one of those people. Clearly, this was a well thought out plan. We couldn't board Toki in a kennel, since he's too nervous and hasn't had his kennel cough vaccine yet. I also don't trust kennels. I've heard of abuse in some and, being so far away, I can't know how they're treating my baby. Yes, I am not afraid to admit that I am an overprotective mother. Alicia is one of my closest friends and although Toki isn't comfortable with her, he's met her a few times before and so knows him better than most of my other friends. With my cousin, Jasmine, to take care of him in the morning before work and at night when she comes home, we only needed someone to watch Toki in the afternoons. Alicia comes in every day for his afternoon walk and deals with my constant worried text messages. Poor Toki is so lonely that he's even excited to see her, and he's afraid of her! Jasmine told us that he hasn't been playing as much at night when she is home as well. I hate hearing that he's lonely like that and I hope that he's alright. My pup has already been left behind so many times and has been through so much. I don't know what dogs think, but I hope he doesn't think we're leaving him alone again. I can't wait to go back home to him. I'm all by myself. All day. There's no one here. Usually, Angel plays with me during the day and she lets me sit outside in the sun and takes me to the park or the store. I don't know where Angel went. Everyone's gone all day. I'm bored. I played with all my toys already. Someone comes and takes me out once a day when Angel usually walks me. Why isn't Angel walking me? At least someone takes me out. I like being out, I try to run and play as much as I can. But I can't do much because I'm attached to the person I don't know. It's better than being stuck inside all day I guess. I don't like being alone all the time like this. It's lonely. And boring. Alright, so it's been a while. Toki and I had our last training class, for now at least. I'm hoping we'll be able to do some more eventually, but I know my parents would never let me hear the end of it. So I'm waiting until we move out and Toki's going back in for training classes. I was excited. I was getting ready to make sure we wouldn't be late, for once. As it turns out, class started 30 minutes early and I forgot, so we were about 25 minutes late. Lovely. We mostly went over some stuff we had done previously: sit, stay, down, come, paw, heel. The trainer decided to start Toki and I on roll-over. This isn't going very well. I can get him onto his side, but he refuses to go onto his back and gets very upset when I try to do it for him. So for now, we're putting that one on hold. He does everything else excellently. Except heel. He does it so well at home and around our street. But once something distracts him, it's all over. Same with any of his tricks, really. He has a very short attention span. My mom jokes that he has puppy ADHD. I try to work with him when he's distracted. When we have people over, I try to go through some of the easier commands. It's hard going, but sometimes I can get him to pay attention to me. The great thing about more training classes when we eventually take him, aside from the socialization, is that he'll be distracted and he'll be forced to pay attention to me despite distractions. But as I've said, I have to wait until I move out or else I'll hear my parents constantly complaining about me paying for more classes for him when I just quit my job. Training is great for Toki, though. It keeps him occupied, and very little does that. When he isn't occupied, he gets bored. When he gets bored, things in our house break. So, I train him to keep him occupied, at least for a little while. I found a website with some ideas for more things to do with him and now Toki and I are working on 'turn', which he essentially mastered in a day. We're trying 'beg' now, but it ends up turning into 'stand', which I guess is alright. It's still cute, so I'm okay with it. Darn puppy can get away with almost anything just because he's so cute. Also, Toki has started digging. Not just the carpet. But outside. On the beach. In the flower pots. In the yard. In his crate. He buries his bones. And then walks away so he can dig them up again a few minutes later. If he can't get outside to bury a bone, he hides it under the couch or under the table where he thinks we don't know. It's adorable and hilarious. Especially when we're at the shore and he buries a bone in gravel that is exactly the same color. We've lost plenty of bones that way. I miss Charlie. I liked playing with Charlie. And Charlie's mom. And the trainer lady. They all gave me treats. I liked their treats. Angel still gives me lots of treats, but I got even more when I got to see them. I like when Angel gives me interesting stuff to do. She moves her hands and says stuff. I don't know what she says, so I watch her hands. I have to do different things for different hand movements and sometimes I forget which one is which. But it's fun. I have to concentrate really hard when she does it. And when I do it right, I get treats. That's my favorite part. I don't like when she does hand signs and I do what she tells me but I don't get treats. I guess it's not so bad because she gets happy. But I'd like treats better.